And in the summer and in the winter we dream about a trip to the fabulous resort. In the winter cold especially want to feel the gentle rays of the sun, the heat and the hot sand of the sea coast. Among the many very popular holiday in Thailand — it’s paradise, where the combination of white sandy beaches with exotic nature and tropical climate, making it a magnet for tourists all year round. Kingdom bordering the Andaman Sea and the Gulf. Thailand beach with clear turquoise water and white sand edged a cherished dream of many! Next, we present you the best beaches in Thailand. 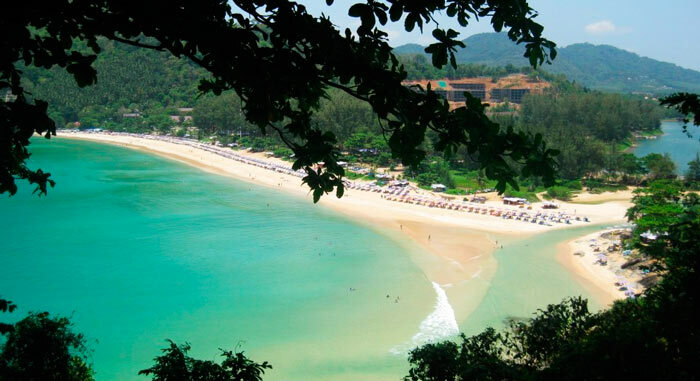 Nai Harn — a snow-white sandy strip, surrounded by his guards — impenetrable jungle, is one of the best beaches in Thailand. It is situated in the southern cove of the island of Phuket. It is ideal for a family holiday. For families with kids the most fits the east beach. The reason for this is the calm seas and gentle entry into the water. True romance also appreciate Nai Harn appreciated, because nothing compares with white sand, blue sea and green palm trees on the horizon in one set. A feature of the beach is the availability of freshwater lakes on its territory. Around him to arrange for all the athletes. Also located on Nai Harn has a yacht club. Diving in this area of Thailand can be quite fun, but in the period from May to September, from him is yet to give up for security reasons. The danger for the fans of this sport are the monsoons.